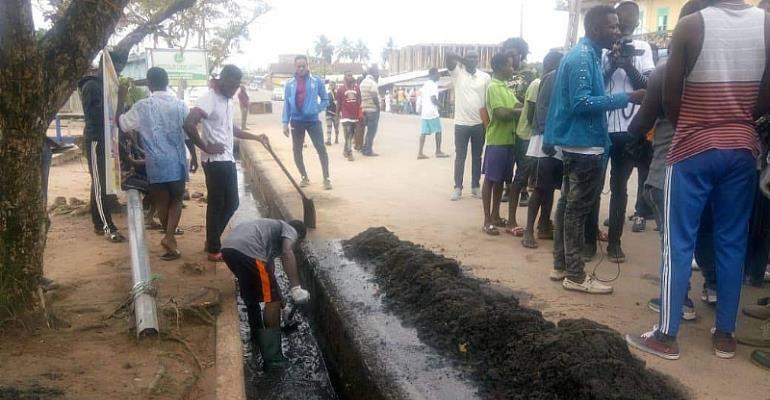 Municipal and District Assemblies in Agona and Gomoa in the Central Region last Saturday defied heavy rainfall to undertake massive clean-up exercise along the major highways in their operational areas. Central Regional Minister, Hon. Kwamina Duncan following fruitful consultation with the Regional Coordinating Council (RCC), wrote to all MMDAs to use Friday 22nd March 2019 to clean up all principal and highways in their respective Assemblies to get rid of firth and to keep the places clean and tidy. Staff of decentralized departments, personnel from Ghana Police Service, Ghana Immigration Service, National Ambulance Service, Ghana Education Service, Audit Service, National Health Insurance Authority, National Disaster Management Organization (NADMO), Ghana National Fire Service and other Civil Society Groups participated fully in the over 5-hour massive clean-up exercise in the respective Assemblies. At Agona Swedru in the Agona West Municipality, the Municipal Chief Executive, Hon. Mrs. Justina Marigold Assan assisted by Nana Kobina Asiedu Botwe II, Chief of Agona Swedru led the exercise from the offices of the Municipal Assembly along the highways in Swedru Township. Pupils from Junior High Schools in Agona Swedru and its environs were not excluded from the exercise. Similarly, Workers from Melcom Group of Company, Artisans, and others participated fully in the clean-up exercise. Addressing the people soon after the exercise, Hon. Mrs. Justina Marigold Assan commended them for defying the rains to adhere to the directives from the Regional Coordinating Council adding the exercise has supplemented the monthly National Sanitation Day clean-up campaign. She noted that the Assembly would continue its efforts of ensuring a healthy environment aimed at eradicating environmentally related diseases. She commended the various departments and agencies for participating in the exercise. Agona West Municipal Director of the Ghana Education Service, Madam Elizabeth Helen Essel lauded Central Regional Minister, Hon. Kwamina Duncan and the Regional Coordinating Council for their foresight saying it has inculcated communal spirits among students in the Municipality. "As I went around the schools to monitor their participation, I was extremely happy about the zeal in which the students and teachers were involved in the clean-up exercise. In the Gomoa Central District, the DCE, Hon. Benjamin Kojo Otoo led Assembly Member, staff of decentralized departments, artisan, transportation unions, Civil Society Groups, teachers and school children to clear the bushes along the highways from Gomoa Asebu-Pomadze, Oguakrom-Nyakuadze, Awombrew, Abonyi, Abaasa, Osamkrom, Mangoase, Brofoyedur, Jukwaa, and Ekwamkrom. Others include Afransi, Obuasi, Gyaman, Esikuma and Gomoa Lome. He announced that the Assembly was intensified its community education on health and personal hygiene after which sanitation offenders would be dragged to court. Hon. Benjamin Kojo Otoo commended Nananom, Assembly Members, Members of Area and Town Councils for using their taboo days to clean their communities. A similar exercise took place in the Agona East District. The DCE Hon. Dennis Armah Frempong was not happy about the performance of Zoomlion Company Limited in the District. He bemoaned the rather 'Lazy' work being carried out by the staff of the company wishing they never existed in Agona East District. "The truth of the matter is that most of Zoomlion workers are too old for the job. They hardly perform their signed duties as required of them. They are also not well paid, a situation is gradually dumping the efforts of the Assembly in the fight against firth in the District. “I have tasked the Assembly Members to monitor activities of Zoomlion workers in their electoral areas and report accordingly to the Assembly for necessary action to be taken against the company if it falls short of its core mandate”. “Government cannot throw monies into the drains. We need value for monies spent from national coffers"
Traditional rulers, school children, Staff of decentralized departments and other agencies assisted in clearing up exercise from Mensakrom through Agona Duakwa to Nsaba.